Colo. Gov. John Hickenlooper addresses an audience Thursday at the site of a future kayak park on the Roaring Fork River in Basalt. Investments in river features pay off for cities and towns, he said. 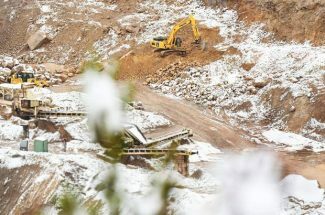 An agreement was reached Thursday that establishes a water right for a kayak park in Basalt and avoids a court battle, Pitkin County Attorney John Ely said. 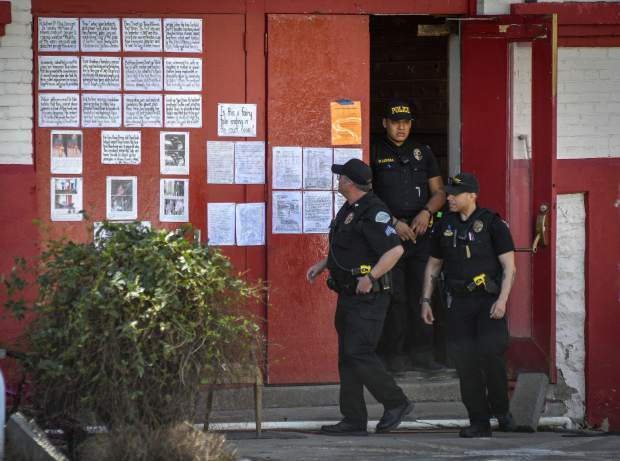 A trial was scheduled to begin Thursday in state water court in Glenwood Springs. 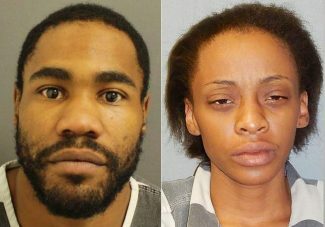 “That trial now will not happen,” Ely said. 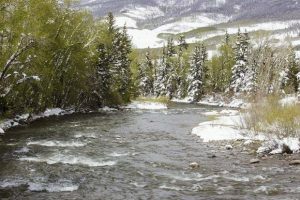 Pitkin County has worked for about 10 years to establish the ability to use water rights for recreational purposes connected to the special project. The county wants to establish a kayak park on the Roaring Fork just downstream from Fishermen’s Park, which is a stone’s throw from the Upper Basalt Bypass Bridge on Highway 82. The county faced opposition from what Ely said he considers “the usual suspects” on water rights issues. One of the parties opposing the county’s plan was the Twin Lakes Reservoir and Canal Co., which diverts from the headwaters of the Roaring Fork River. Ely said various parties involved on both sides of the court battle stipulated a settlement rather than proceed with the trial and an uncertain outcome. It was a model of give-and-take, he said. “Everybody left the table being hungry,” Ely said. The agreement allows Pitkin County to call for water for the kayak park between April 15 and Labor Day. Differing water levels would be called at different times. The most water would be tapped for the park during spring runoff. The amount would be lower before and after prime runoff. A conceptual plan for the kayak park proposes two rock structures to be built in the river channel to create wave features. Beginner and intermediate kayakers will be targeted. Ely noted there is a wave feature on the Colorado River in Glenwood Springs that targets experts. Ely used an analogy to local ski areas to describe the difficulty of the kayak parks. Basalt’s kayak park will be “a Snowmass compared to Glenwood’s Highlands kind of experience,” he said. The primary place for kayakers to put into the river will be an existing boat ramp across Two Rivers Road from Fishermen’s Park. Features such as parking and spectating areas could be built on the bank downstream from the boat ramp, according to Ely. 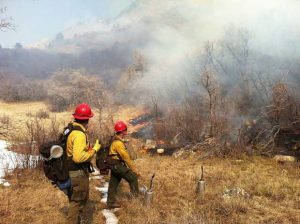 The town of Basalt and Pitkin County will likely review details of the plan, he said. “It’s been about 10 years since this dialog first started,” Ely said during a ceremony Thursday at Fishermen’s Park attended by about 25 people, including Colo. Gov. John Hickenlooper. Ely said the kayak park could tie into riverside work Basalt is performing further downstream. All the work is designed to enhance public access to the river. “We didn’t want to miss an opportunity to re-orient the town,” Ely said. 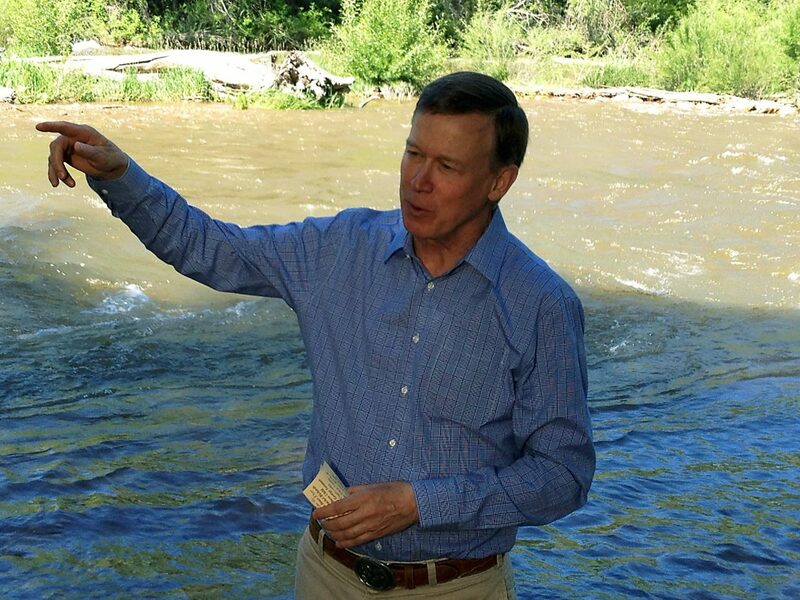 Hickenlooper congratulated Pitkin County and Basalt for their river work. He noted that investments made in river features by towns such as Buena Vista and Salida have paid big dividends.